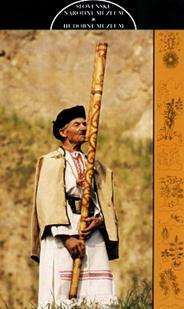 Fujara is typical folk flute originating in small area of middle Slovakia - Podpolanie region. Fujara flute maintains its royal status among the folk musical instruments of Slovakia already for centuries. It is mostly ornamented by a "flower" scrimshaw, that represents the traditional folk ornamentation from the "Podpolanie" region. The Podpolanie region is located in the center of Slovakia. Here can be found a great variety of music instruments: variety shepherds' flutes including the bass overtone flute Fujara played in solo, duet or quartet, several kinds of shepher pipes (koncovka, whistle) some peasant bagpipes, and a string ensemble which performs dance music or accompany the songs to order. All these genres and repertories show the long evolution of Slovakian folk music.